2. Meanwhile, spray a saucepan with oil and cook the onion, garlic and half the torn basil for 3–4 minutes until golden. Add the passata and simmer gently for 5 minutes. 3. Preheat the oven to 190ºC, gas mark 5. 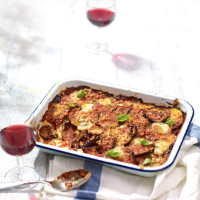 Layer the aubergines and sauce in a heatproof dish, scattering with mozzarella and the remaining basil as you go. Stir together the Parmigiano Reggiano and breadcrumbs and sprinkle over the top. Spray lightly with a little more oil and bake for 40–45 minutes until golden and bubbling. Scatter with a few leaves of basil to garnish, and serve. For a variation on the traditional version, try adding in some other grilled Mediterranean vegetables such as peppers or courgettes.